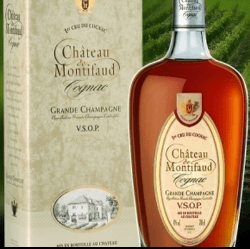 Ch Montifaud VSOP Grande Champagne Cru Cognac single pack. We can add cards to the gift. Ch Montifaud VSOP Cognac in a single pack. A great Brandy Gift Idea for an Anniversary, Christmas Brandy gift or as a retirement present. Send a bottle for a lover of Cognac. The package is also suitable for postage. We can add a card to the gift which is free, we have a selection of cards for any occasion. The Château Montifaud has belonged to the Vallet family for six generations now. The vineyard was created in 1837 by Augustin and has seen the succession of Pierre, Maurice, Louis and Michel. Laurent came to join his father and grandfather in October 2000. According to the family tradition, when a son joins his father, a part of the cognac distilled in that year is set preciously aside and will only be sold by the future generations. Thus it is that in the darkness of our Paradise cellar lie bottles of Cognac skilfully made by Pierre and Maurice Vallet. Our family cellars have also seen the ageing of cognacs that date from 1920 to the persent day, part of which, in vintage years, has been sealed by the B.N.I.C (the National Interprofessional Office of Cognac). In the Grande and Petite Champagne whole soil contains a very great amount of active limestone. This chalky content plays a dominating role in quality of our Eaux de Vie (spirits, cognacs). Thanks to this exceptional land, Château Montifaud possesses an extremely high potential for quality. During each of the different phases of making our cognacs (producing, distilling, ageing), we apply our traditional craftsmanship and skill handed down from father to son.